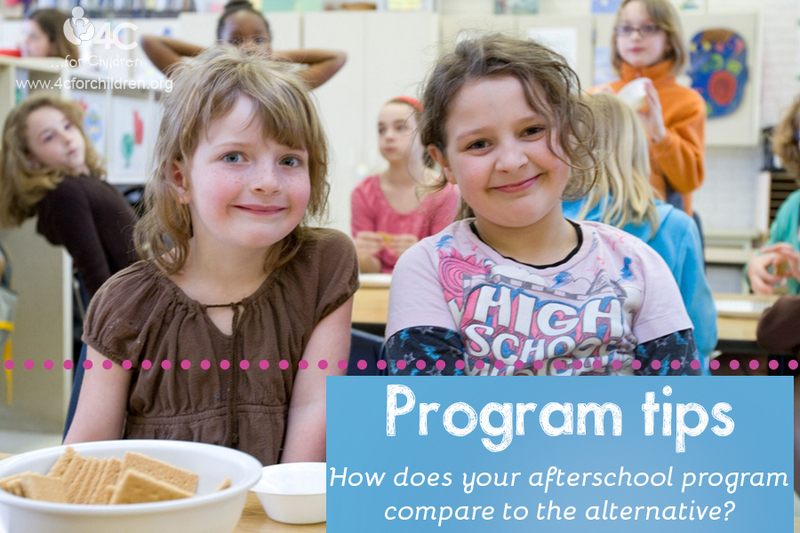 How does your afterschool program compare to the alternative? As I sat in the waiting room of my doctor’s office recently, I picked up a copy of Parents Magazine and started thumbing through it. I came across an article entitled The New Latchkey Kids and was intrigued. They very next line after the title said “More than a million grade-schoolers have nobody to take care of them once class lets out. Where have all the after-school programs gone?” At the first sentence, I was nodding, knowing all too well how many children are at home unsupervised after school. At the second sentence, I did a double take; I had to make sure I had read it correctly. Knowing how many programs I visit on a regular basis, it was difficult to imagine how they could say that there was a scarcity. So, of course, I had to keep reading to find out. A few paragraphs into the article, it described the cuts in funding and limited access to affordable child care options. That may very well be the case. I can definitely see that being an issue for many families, as has been discussed in our Advocating for Children blog (November 2013) many times. It is a tough decision to send your child home alone because you can’t afford it, when there is so much evidence that child care programs, serving anywhere from infant through school-age, are incredibly beneficial to a child’s learning and development. It’s also tough, as a provider, to know that you are losing a child from your care, at no fault of your own. When I ran an after-school program in Indianapolis, there was a family of four children who needed to drop out of the program because of finances. Our fees were not high, but it was more than they could afford. I volunteered to pay for a month of care for them because I knew how crucial it was for the children to have somewhere to go. Another section of the article touched on what the ‘ideal age’ is for a child to stay home alone. They cited that, at the time the article was published, only two states have regulations for a minimum age. Those states were Maryland (8 years old) and Illinois (14 years old). Other states had set recommendations, but many didn’t even have that. Knowing there is no minimum age for Ohio, I often find myself asking the staff I work with, “What would the children be doing if they were at home instead of in your program?” A lot of their answers revolve around video games and television or movies. Together we brainstorm ideas to make sure what they provide in their afterschool program is substantially different from that. When parents are faced with the whether to continue sending their child to an afterschool program because money is tight, they are going to want to see that there is more being offered in the program than what the child could do for free at home. What are your thoughts on the availability of affordable child care, being providers of that care? What steps have you taken to ensure that parents want to send their children to you? I’d love to hear about it in the comments! This entry was posted in Advocating for Children, School Age and tagged afterschool, cost of child care on March 6, 2014 by Janine Rigg.